Intertwining covered alleyways located in the bowels of Old Jeju’s shopping district make up the oldest and largest outdoor market on the island. 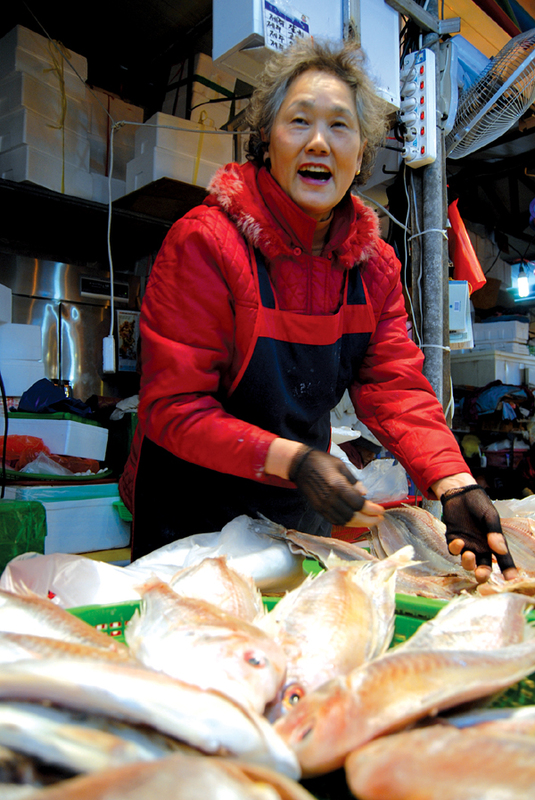 Established decades before the first muttering of the word “mart” on the island, Dongmun Traditional Market greets each visitor with a blast of attention grabbing colors, scents and sounds. From the brilliant, nearly-glowing Hallabong oranges seeming to light up the alleyways on their own, to the friendly banter between vendors and customers as pork samples are offered and bargainers lock down deals, combined with the fresh smell of fish who completed their final swim just hours before, life inside Dongmun beats strongly as you meander around inside. In the same way an aging celebrity might look to plastic surgery to erase the marks of time, Dongmun Market is in need of a facelift. Fortunately, it is about to receive just that. Designated a Culture-Tourism Pilot Market in 2008, Dongmun is currently undergoing major renovations aimed at boosting its popularity and making it a must on the plans of any tourist travelling through the city. 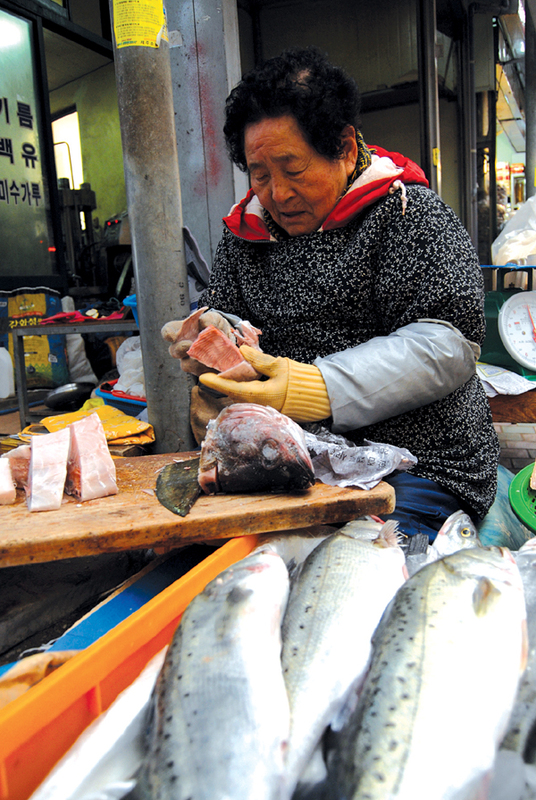 Along with four other traditional markets, including the Five-Day Market, Dongmun will share the benefit of a 1.9 billion won grant from the Jeju government. A quick glance around makes some changes already apparent. New fluorescent signs glow above each vendor, displaying the goods offered at each booth in Korean, English and Japanese languages. In addition, each booth’s number stands out in bold, simplifying the process for customers wanting to find their way back or share the whereabouts of a friendly vendor. The signs light up the darker alley-ways, and give the market a modern feel. In addition, new roofs are being built higher than the originals, allowing customers some additional breathing room. Major changes include not only the interior of the market, but the surrounding districts as well, which will become themed streets. While completion dates are yet to be determined, the major east-west street running through Jungang Rotary, from Chilseongro to Gwandeokjeong, will be transformed into a “Nature Street.” Illuminated fish will light the way along sidewalks constructed of a material similar in appearance to basalt (volcanic rock). The intersecting north-south street, from Nammun to Jungang Rotary and down to Tapdong will become “Culture Street,” displaying artwork and sculptures. A large arch has already been placed at the entrance of Kumgang Mall, symbolizing a Jeju volcanic cone, known locally as oreum. The overall vision of the themed streets is to amplify the experience of the area, building the opportunity to better connect tourism with the market and restoring Dongmun to what she was in her youthful heyday, the cultural heart of the city. 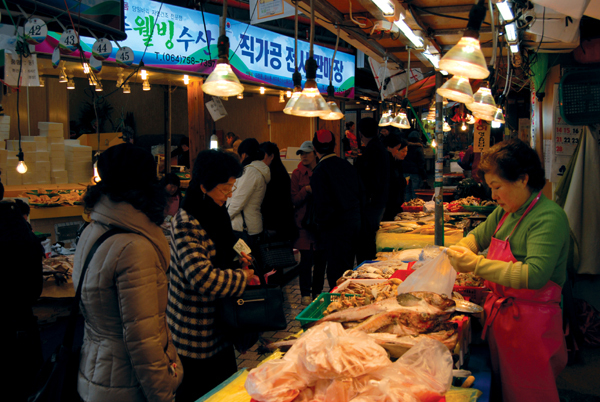 After Korea broke free of Japan’s grasp in August of 1945, Dongmun Market emerged as the base camp of Jeju’s commerce and business district. Conveniently located at the first and last stop of the city’s bus lines, Dongmun was the place to see and be seen. Trend-setting clothing was featured, and many high-end products attracted the glances of women and emptied the wallets of the men attempting to win their affection. For those planning a wedding, a trip to the market was essential to pick out the necessities. Fast forward 65 years, and you’ll find vendors eager for the completion of the market’s facelift, and hopeful of the revival of the area’s prosperous past.